The e-pill CADEX VibraPlus SPORT is a medication reminder watch that looks like a normal sports watch. Program up to 8 daily alarms that auto-reset each day. The watch face shows real time, a stopwatch mode, and unique Count-Down Timer mode. Never forget to take your medications again and avoid medication errors. 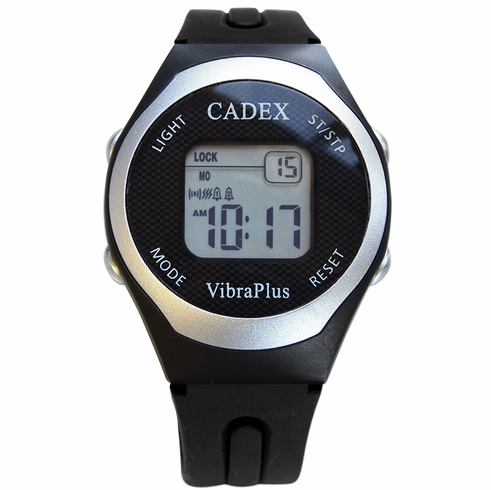 Originally developed for children with diabetes, the e-pill CADEX VibraPlus watch vibrates discreetly. The watch is not only for children - this watch style is for adults and teenagers! Size of Face: 1 1/2" x 1/2", Watch digits 1/4"